Ketley Brown Brindle Pavers are a unique product, the result of careful control of the kiln atmosphere during the firing process, which produces and aesthetically pleasing random colour variation and an organic appearance when laid. 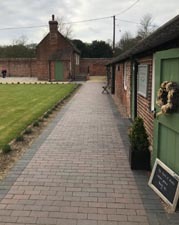 Ketley Brown Brindle Pavers are the authentic product, a perfect match for restoration projects such as canal towpaths where they are widely used. 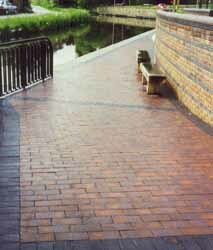 Ketley plain pavers were chosen in a joint redevelopment with Birmingham City Council of an area of Birmingham’s canal system, which subsequently became known as Canning Wharf, because of the ability of Ketley Brick to manufacture paving bricks of outdated dimensions of 10”x5” and 12”x6”. 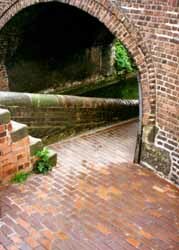 British Waterways were delighted with the appearance of these pavers and as a result generated a standard specification for Ketley Brown Brindle pavers to be used for all the quadrants where the lock gates are opened. This in turn led to paving large areas of towpath in the general refurbishment of the canalside in the urban environment. There are more miles of canal in Birmingham than there are in Venice, so this project became a major user of Ketley products especially during the 1990’s. This continues to this day when sections of the canal are ready for refurbishment, although nowadays this comes under the auspices of the Canal and Rivers Trust. Ketley Brown Brindle pavers are laid here in a stack bond with a light mortar. This large area of Brown Brindle pavers is broken up by sections of Ketley 8 panel staffordshire blue patterned pavers. The straight lines of light mortar tie in with the geometric lines of the panelled pavers creating an attractive space. 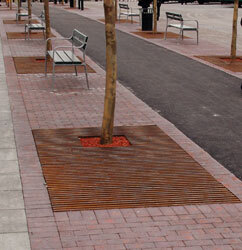 Brown Brindle pavers were selected by the planners of Hyllie town centre, a new town on the outskirts of Malmo in Sweden. 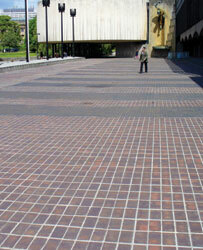 The several hundeds of thousands of pavers used are a key feature of the pavements and pedestrian walkways and provide a warm contrast to the stone and concrete around the arena. 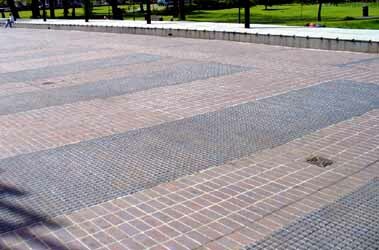 Ketley Staffordshire Brown Brindle Pavers are produced at our works located in the heart of the Black Country. They have been made from our own Etruria Marl since Victorian times. Their unrivalled physical properties include their strength, durability and permanence of colour. 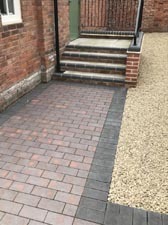 Ketley Brick have a long history producing special bricks and pavers. Our unique plant produces a traditional natural clay colours for both the Paver and Brick ranges. Because our squares, pavers and specials are fired together, our colours are consistent through the range. Ketley Brick also offers a made to measure service for bespoke requirements, this is covered in the Special Shapes section. Clay pavers should be laid in accordance with BS 7533-3:2005+A1:2009. It is useful to plan the layout of pavers before full scale laying begins. It may help to minimize the number of pavers that need to be cut. It will help to identify the likely sand surcharge needed in setting levels. It will also indicate the likely finished appearance and the standard of on-site workmanship. Clay pavers should be laid by hand, commencing from a straight starting edge on the prepared bedding course. They should be laid slightly open to provide a finished joint width between pavers of approx 2-5mm beyond the edge protection nibs to permit infill and to minimise damage in compaction and subsequent use. Failure to do this may result in chipping of the clay pavers. 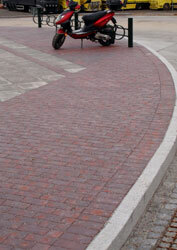 Ketley pavers can be supplied with or without nibs. (Please note the nibs are there for edge protection of the pavers and are not spacer nibs, therefore the nibs should not be used to determine the gaps between pavers). 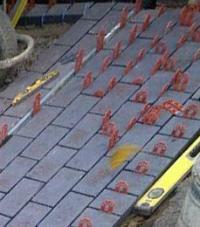 If deviation from the bond pattern does occur, the pavers can be adjusted to open the Joints to about 5mm. This process is known as gapping. A small percentage outside this figure will not affect paver performance. When a 90° herringbone bond pattern is used, a string line should be set up at right angles to the starting edge, and a "nose" of paving can then be advanced along it. When laying 45° herringbone pattern the laying face should develop parallel to the starting edge. 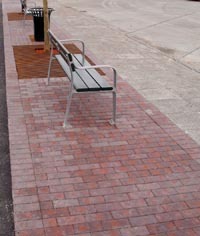 Pavers should be selected from three or more packs to ensure a thorough mix. If stocks of new pavers have to be laid on new work, they should be stacked about one metre back from the leading laid edge. As far as possible whole pavers should be used. Pieces of less than 1/3rd of a full paver should be avoided. Various items in the Ketley range of paver fittings overcome this problem. Infilling of boundaries and obstructions should be completed before vibration commences. Paver cutting should be carried out by a disc cutter, not by the use of a splitting machine or hammer and chisel. 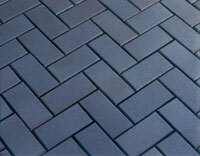 It is important to check the pattern of pavers against string lines as work progresses and adjust as necessary. Once a sufficient area of clay pavers has been placed, approximately 40m2 on larger sites, fine dry sand should be brushed into the joints. After brushing into the joints, surplus sand should be brushed away before compaction begins. 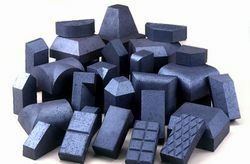 Pavers should then be compacted into position by two or three passes of a vibrating plate compactor fitted with a neoprene pad. As recommended in BS7533-3:2005, the plate area should be at least 0.20m2. it should transmit an effective force of 50-75 :kn/m2 at a vibration frequency of between 60-IOOHz. Compaction should not be performed closer than one metre from any unrestrained edge. Further sand should then be applied and the procedure repeated. After final compaction 1-2mm of sand can be spread over the paved area to promote joint fitting and to fill any voids which may develop. Commencement of use of the pavement may need to be delayed if the bedding course is saturated following heavy rain. During the early life of the pavement there is likely to be some settlement of sand within the joints. Therefore the site should be monitored and arrangements made for further sand to be brushed in, to top up the joints.